Today was a relatively short day with only 20km but, for some reason, it was still hard. 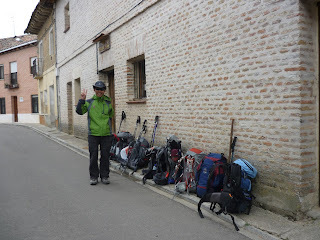 I´m revising my earlier comment that "there´s never an easy day on the Camino but some are easier than others". Now it´s all days on the Camino are hard and some are just a lot harder than others. Battling shin splints is tough and I think Dayton is starting to get them too. His could be due to the added weight he´s carrying from the few teeny weeny little tiny things I´ve had to add to his pack. We took the alternate route from Fromista so that we could walk along the river path rather than the main road although, with today being Sunday, even the main roads are fairly quiet. We are all just cherishing the moments on the Meseta. What wonderfully peaceful walks! We got to Carrion de los Condes before the alberque opened at noon today. James and Son were already starting the backpack line up to get in. This alberque is run by the nuns of Santa Maria, very welcoming but I think we have to go to mass at 7pm. I think they take attendance and who knows what the penance is for missing - no wine? Tonight we´re having a big group meal with everyone contributing something. With the limited produce available at the local supermercado, it´ll be like the Iron Chef with everyone having the same ingredients to see what they can come up with. Whatever, it will all be good.